England players jog during a training session at Corinthians Arena in Sao Paulo on June 18, 2014 on the eve of a FIFA World Cup Group D football match between Uruguay and England. England and Uruguay, two of the tournament’s strongest teams to lose their openers, play in what is essentially a must-win match for each side on Thursday, and is the pick of the day’s matches. Colombia versus Ivory Coast should be a slightly better match than England versus Uruguay, according to the method we’ve been using to identify each day’s best match (calculating the harmonic mean of each team’s Soccer Power Index rating). But they’re also much more mismatched: Colombia ranks fifth in SPI among the 32 World Cup teams, while Ivory Coast ranks 17th. England and Uruguay rank ninth and 11th, respectively, so while there will be a bit less quality on the pitch according to SPI, it should be a closer contest. 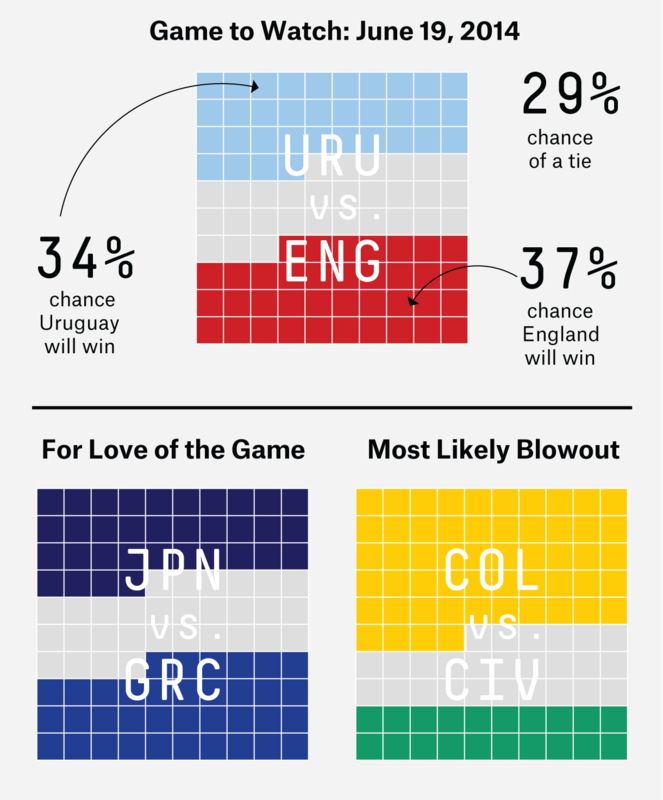 FiveThirtyEight’s SPI-based model gives England a 37.3 percent chance of winning, compared to 33.9 percent for Uruguay. Colombia, meanwhile, has a 54.2 percent chance of beating Ivory Coast, and just a 25.7 percent chance of losing. We touted England’s opener, against Italy, as likely to be one the group stage’s most competitive matches; England-Uruguay could be just as close. This match wasn’t supposed to be a must-win for the pre-tournament co-favorites in Group D. Uruguay and England each started the Cup with a more than 60 percent chance of making it through the group. Then, disaster struck: Each team lost its opener: England 2-1 to Italy and Uruguay 3-1 to Costa Rica. Those are two of the worst results for teams in their Cup openers this year, relative to expectations. Two teams other than England that produced better scoring opportunities than their opponents also lost: Ghana, against the United States; and Algeria, against Belgium. And two teams other than Uruguay lost by even more than expected based on scoring chances: Greece, against Colombia; and defending champion Spain, against the Netherlands. That new way of looking at Colombia’s 3-0 defeat of Greece might mean Thursday’s other two matches will be closer than they appear, since Colombia is heavily favored against Ivory Coast and Japan is favored against Greece. Then again, this method may just identify teams that are better at creating and denying opportunities than they are at finishing and keeping balls out of the goal. Maybe Wayne Rooney and Raheem Sterling weren’t unlucky in going a combined 0 for 7 on shots against Italy — maybe they’re not good finishers. And the same goes for Spain, eliminated from the knockout stage after scoring just one goal against an expected total of 3.43 goals in its two matches. The last World Cup showed that some teams that struggle to finish and to deny opponents shots in their openers rebound later in the tournament. Spain lost its opener to Switzerland in 2010 despite producing and allowing shots that should have given it a 0.34-goal win, on average. Spain won its next six matches, and the World Cup. But other sides that fit the profile didn’t produce better results in their second and third matches: France, Cameroon and Algeria all looked primed to improve yet exited the 2010 tournament without a win. England and Uruguay must try to channel Spain’s 2010 improvement. The side that doesn’t likely only gets one more match in this tournament. CONMEBOL, the South American Football Confederation, is the only confederation with a winning record against Europe’s UEFA at the World Cup, 87-78-48 all-time. And not much has changed this year. On Wednesday, Chile became the third South American team to beat a European side in four tries in Brazil, eliminating defending champion Spain with a 2-0 win. Goalkeeper Iker Casillas is a legend in Spain, but he has had a nightmare tournament, making crucial errors that both of Spain’s first two opponents converted for goals. In 2010, Casillas stopped 15 of 17 shots on goal, captaining Spain to its first World Cup title. Casillas was excellent again at Euro 2012, making 15 saves of 16 shots on goal, as Spain successfully defended its European championship. Casillas has faced 14 shots on goal in two games at the 2014 World Cup. Seven found the back of the net. Spain’s problems aren’t just in goal. Diego Costa scored on 27 of 54 shots on target (50 percent) in La Liga play during the 2013-14 season, better than Lionel Messi and Cristiano Ronaldo. Costa steered Atlético Madrid to the title. In Brazil, Costa has four shots in two games, with one on target. Against Chile, he finished with 20 touches before being subbed off. In Atlético’s league games last season, Costa averaged 39 touches per 90 minutes.